CHICAGO, Dec. 10 (Xinhua/Sun) -- About 200 anti-violence people gathered in Chicago on Wednesday, the International Human Rights Day, to protest against police brutality in domestic law enforcement and the government's military operations overseas. In the chilly night, the protestors made a rally at downtown and began marching through the city's main streets, holding banners and signs, posing chokehold postures and shouting slogans. Ellett Farler, whose son was killed by a Chicago police officer three years ago, told Xinhua that he came to the rally to seek justice for his son and other black victims. "I'm here for the family of Michael Brown and the family of Eric Gardner. They are also victims of police crimes. We are sick and tired of it. The police are actually killing people and not getting indicted and getting away with it," Farler said. Protests intensified across the United States recently after grand jury decisions of non-indictment of white police officers involved in the July death of Eric Garner and the shooting death of unarmed black teen Michael Brown. A report detailing tortures and abuses conducted by U.S. Central Intelligence Agency (CIA) against prisoners in Guantanamo and Afghanistan released on Tuesday has further sparked anger and criticism. 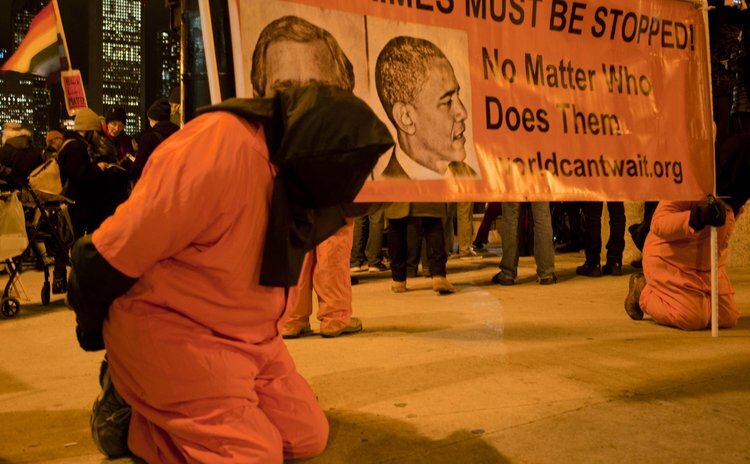 Some demonstrators on Wednesday dressed up as prisoners and knelt down on the ground, alluding to CIA's harsh interrogations of detainees revealed in the report. "It's International Human Rights Day," Kait Mcintyre from Anti-War Committee Chicago told Xinhua. "What we're trying to do is to take a look at what's happening here at home with the police brutality and violence, things like the case with Eric Gardner and Michael Brown in Ferguson. And combined with the atrocity that's happening abroad with the U.S. attacking Syria and Iraq." Mcintyre said the U.S. government should have started focusing on what happens at home rather than acts like a human rights defender and tells the rest of the world what to do.